For My Martha Stewart Radio Listeners - Summer Kitchen Style! What a pleasure to be on Martha Stewart again, today, my third appearance. It's always fun and inspiring to chat with Brian Kelsey on Morning Living - he has so MANY quick, out-of-the-box great ideas on making your home your personal sanctuary - not to mention creative laboratory! Here are tips on summer style for the kitchen that I prepared, which, at this writing before the show, I'm not sure we will get to cover. Please add yours too! 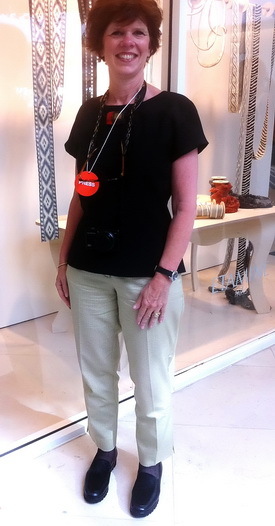 See my pinterest board for Martha Stewart summer style listeners! 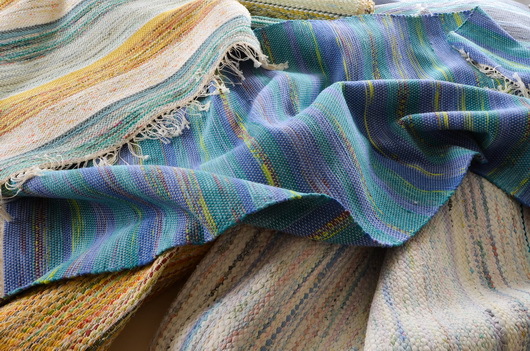 A bundle of fresh colored summer rugs! Having a mother who is a long time accomplished kitchen designer, and a father in the construction trade, I've grown up surrounded by all types of home renovation, specifically of the kitchen kind. I've worked with (ok, for) my mom on and off since I was a teenager - looking to supplement my babysitting income with a little extra to buy that awesome jean jacket that all my friends had - and now as an adult, feeling privileged to join the family business in a bigger way and follow a true innate passion. Living in Manhattan for the past 8 years, it's been admittedly difficult to fulfill my passion for beautiful and functional kitchens while having my own space to cook in that was barely bigger than a shoe box. I've made do, however, and never let the lack of a four-burner stove or dishwasher stop me from hosting huge dinner parties or cooking up elaborate, special meals for my family. I've become an expert in space efficiency, and while I have graduated to full size appliances and granite countertops, I'm still storing my pots and pans in the oven. I look forward to the day when everything has its place and I can have all the single-use small appliances of my dreams! Perhaps you're wondering what took me so long to follow my passion and join my mother in her business. It's long been a thought in the back of my mind, and something I knew I'd pursue eventually. However, as children do, I fought hard forging a path of my own and after college (Fordham University) fell first into publishing and then online advertising, working for great companies such as Harper Collins, CNET and Yahoo! and enjoying the many perks of a sales & marketing executive to Fortune 100 clients. As nature took its course, I got married, had a baby, and decided the full time corporate life just wasn't for me anymore. I felt it was time to come home, in more ways then one. So here I am...thrilled to be joining my mom in this adventure - from the blog, to our launch of Bornholm Kitchen, and all things in between! Now, what should you expect from me? In terms of blog content, I'll be focusing on style, products, accessories, and appliances and trying to add a little personality to this once-utilitarian room. You've probably noticed the new sections we've added above. Moodboard Mondays is simply a coalescence of products, surfaces, rooms, and images meant to delight and inspire. Kelly's Finds will profile unique and useful products I'll be seeking out in my travels throughout the city and across the web that can add some character and efficiencies to your kitchen. We've come a long way from working kitchens of yesteryear designed purely for function, and I look forward to livening up this space with you! Here I am...in full production below! A couple of words from Susan/aka mom: I have been anxious (to say the least) for Kelly to join me in the family business. I could not be more thrilled - Kelly is smart, uber stylish, on trend to the MOMENT but with a global foresight and interest in the word "why." I'm VERY lucky to have her and I think you'll enjoy Kelly's insight too. Most of all, we LUV to laugh out loud and often! Oh, look at this brunch to see the fabulous finished dishes from the image above. Oh, just a short little story, but it sure does warm my heart and I want to share it with you! Just earlier today, I went to visit a friend in the hospital. Much to my surprise, right next door, was a store called Zorn's. I had not thought about Zorn's in, well, decades. 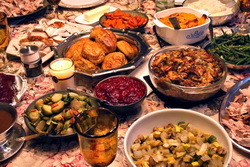 Before my mother died in 1988, she cooked a big Thanksgiving dinner every year. It had all the trimmings, and my mother was a fantastic cook who could make the most gourmet meal out of common ingredients on any given weeknight. My mother's stuffing for Thanksgiving was GREAT. It had a wonderful blending of fresh flavors that was so savory, so absolutely delicious, everyone looked forward to it year after year. Between Thanksgiving dinner and subsequent turkey sandwiches with stuffing, the memories I conjure up right now are pretty intense. But....my mother (and father) were immigrants from Denmark. My mother, um, didn't know squat about making stuffing. Looking back, I don't think she ever really "got it." How did I find out? Smart, very smart, woman - when my husband and I were dating, I guess she figured that she could certainly ask him to do her a favor and my guess is she probably told him to keep a secret...OR ELSE, knowing he would! What she told my husband to do was to go to Zorn's, now, about 45 minutes away from where she lived, pick up the stuffing, bring it to her and KEEP QUIET about it! A guy dating the mother's daughter is not going to do that? She's no fool! Obviously, she had been going there for YEARS. I don't remember how or when we all found out her secret, but we were completely shocked when we did, given her great cooking skills. What great memories I had seeing Zorn's today...and my husband (the same guy) and I bought lots of Thanksgiving trimmings there today...including their stuffing. I'll have two types of stuffing at our table this year - mine and Zorn's. It will be REALLY interesting to see who likes which stuffing best! 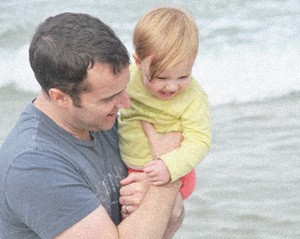 This will be a little piece on random tales and my personal observations of fathers...and kitchens and a bit more. I'll tell you what it won't be. It won't be, even on this Father's Day, pure praise for perfect fathers. You can find that in lots of places. 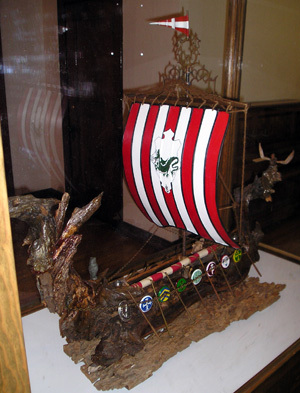 Viking Ship Made by My Father on Display at a Museum in Seattle-he often worked with driftwoodMy father (born in Copenhagen, Denmark) was a flaming narcissist and I say that not with bitterness, no, but with affection, truly. The man was a charmer. And, most of my life, I ate it up and pined for more. I idolized him. He was a little funny looking, but made up for it with a passion for life. He was a free spirit...yet a straight laced entrepreneur who built a business that designed and manufactured a few parts (among other things) for Apollo 11 which went to the moon. He was a government defense contractor. He drove a cadillac, drank scotch, smoked a pipe (had a collection) and wore fancy suits. 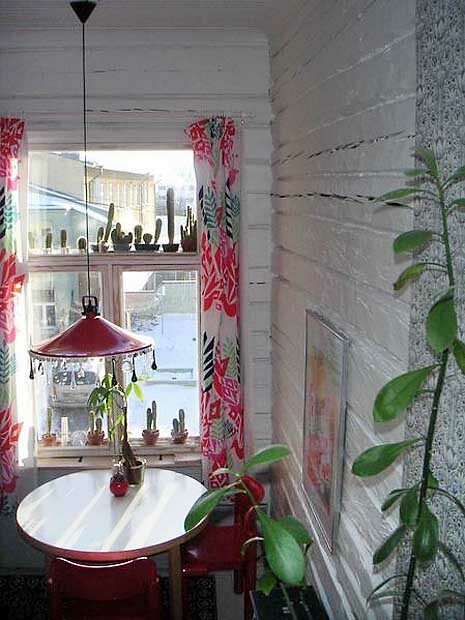 We lived in a Danish modern home. Some years later, I guess in his 40s, he lost the business. I think it was due to his narcissism and ultimately his difficulty working with others. He then landed a job with Boeing and moved his new family (he had divorced my very sensible mother, also from Copenhagen) to Seattle. It wasn't long before he lost that job. He sold cars for awhile until he couldn't work cooperatively with anyone. A lover of art, a passionate collector, an artist himself, primarily a sculptor, he reinvented himself, and I mean reinvented! He grew his hair long and wore it in a ponytail or a braid. He grew a beard. I think he evolved more into the core of his identity. An early drawing of my father'sHe scavenged garage sales and thrift markets and created a small business auctioning off his treasures which he thought had value. He profited and lost. 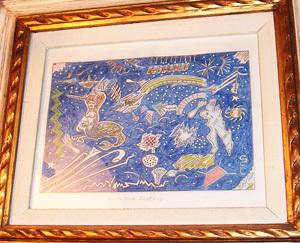 The walls of his house were filled with art. Although I'd say I'm sure he was tormented from time to time, being a narcissist, especially when people didn't give him the time of day, since it was everyone else who was problematic, he stayed in an oddly happy bubble. He always spoke from his heart. That, I've got to give him. 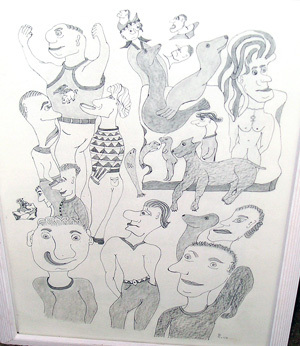 A drawing from Svend Christensen, my father, that he did in his 80s entitled "Night Time Fantasy"Finally, he and his wife could not afford the house, and they moved to an apartment. He had sporadic interest in his 3 kids he left behind in Long Island before and after the move. I once said to him, "you left when we were teenagers to go across the country and you never flew us out there." His reply was, "do you know how much it cost to move to Seattle?" Oy. I knew at the time that was a wacky response! I helped him numerous times financially and toward the last few years of his life, sent him money monthly. One of countless images my father drew in his 80sEvery Sunday when I was growing up, before the divorce, my mother would take us kids to church and upon arrival home, my father would have prepared a great breakfast! My father was the master breakfast maker and, of course, this being the 60s, the master backyard griller, complete with dog, a beer, and Frank Sinatra. He made a big production (of course) of whatever he cooked and that was fun. After the good years, I clearly remember my father telling me as I was soon to walk to the bus stop at 13 years old, that he and my mother would be getting divorced, and he would not be there when I returned home from school. He told me in the kitchen when he was sitting down eating his breakfast. Not the best timing for that message, I don't think! Yes, he was a difficult, and wonderful-at-moments, father, but certainly an interesting one, and now, I have perspective. But, wow, he was really something. None of us are perfect and we are mostly a product of our own upbringing, and his was especially difficult. 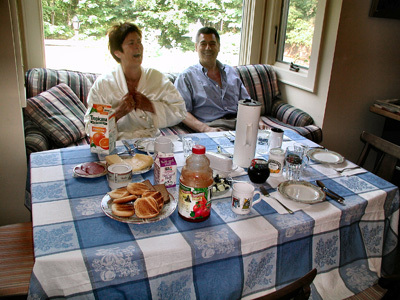 I'll always have those Sunday morning breakfasts, that's for sure. It's known among my siblings that I take after him the most...except for the narcissism! I absolutely believe that my similar personality characteristics of being a big, very deep, thinker, a free spirit, having a positive outlook, being a passionate person with vision, one who is comfortable with risk, enjoys creative endeavors, comes almost solely from his influence...geez, sounds a bit narcissistic! BUT, negative attributes coming from him? The same, any one of these characteristics which, if taken too far afield, might not bode well for every day living as history proved for him...the paradox! Checks and balances...I think many of us try to embrace the best qualities and temper the negative ones from our parents. 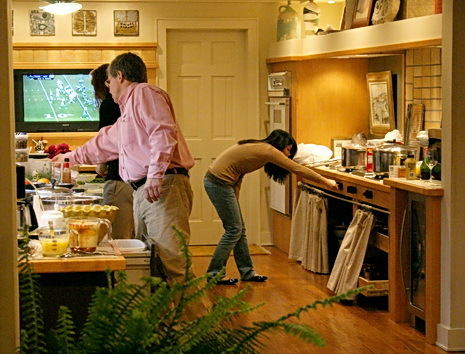 The patriarch in the kitchen preparing breakfast, a few days ago during our Cape Cod vacationBack to kitchens, as I reflect on my father's connection to our kitchen, I will say that in my design practice, more and more men are happy to be cooking in the kitchen. Maybe they have specific dishes or meals they like to cook, maybe they just like to assist. I'm definitely seeing more input from dads about the family's needs in the kitchen, special accommodations for the family, and an overall much higher interest in being involved in the cooking process than ever before. It's a nice trend to see. 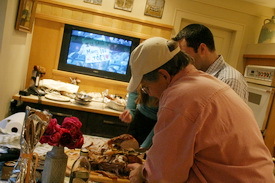 My husband, father to our 3 children, has also taken on a more involved role in the kitchen as the years have gone by. Always the one to go out and get breakfast foods, especially when our grown children and their SOs are visiting, always the self motivated director of cleaning up, just always happily and selflessly wanting to serve others in the family, having everyone's comfort in mind, today, we will treat him like a King! I will force him to relax, which could at first be uncomfortable for him, but he deserves it. All you dads out there...life isn't easy, it's a real roller coaster, but it's days like this that are important to stop the routine for a moment and enjoy the simple pleasures of family....and food is always in the equation, isn't it? To my son-in-law, who we just spent some days with in Cape Cod last week in their rented home to which they graciously invited us as well as our son and his girlfriend, you're an amazing dad to my granddaughter. You are her Prince Charming now and you always will be. I see that you get it. She's a VERY lucky girl, that Chloe! Love you and have a perfect Father's Day today! And all you other dads too! I like Nate Berkus' style - I'm definitely a fan! Style is the word that comes to mind when I see interiors that have been touched by his creative hand. I often see a philosophy of Nate's work which expresses "tradition with an edge." Nate's "edges" are awesome...cool color stories, tradition meets modern, texture meets soft, pattern dominates to unify, among so many more design concepts that delight, and always, for some reason, just feels right! Nate's infectious enthusiasm for design translates into an ease, a gracious informality that's easy to live with. I mean, I see him on Oprah, and before I know it, I'm smiling. He's seems to be such a happy guy! Creating interiors with a happy disposition definitely shines through one's work. I'd love to see Nate do more kitchens, and I'd love to collaborate with him! Here's Nate's kitchen in his Chicago apartment. It flows. I love the black window trim. The turquoise is a great color and just flows into a collection of clean, solid, elements, sort of a framework for the room. 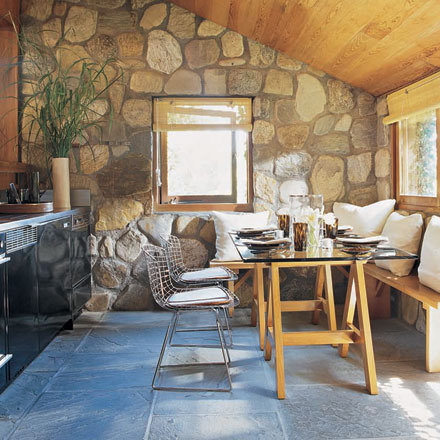 And, those chairs and table...LOVE. 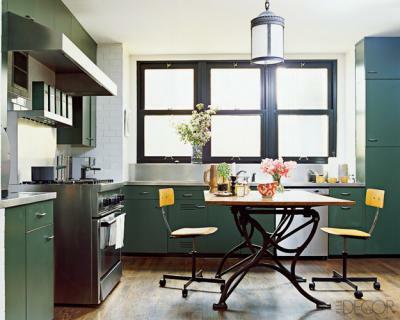 And Nate's Manhattan apartment....this kitchen I love! I'm a real lover of white floors...I have two painted white wood floors in my own home. It looks very much like a Swedish rag rug on the floor and the blue, black and touches of wood just punch up the space. The enveloping white on floor, ceiling, and walls, is the unifying element, which adds a flow and maximum spaciousness. 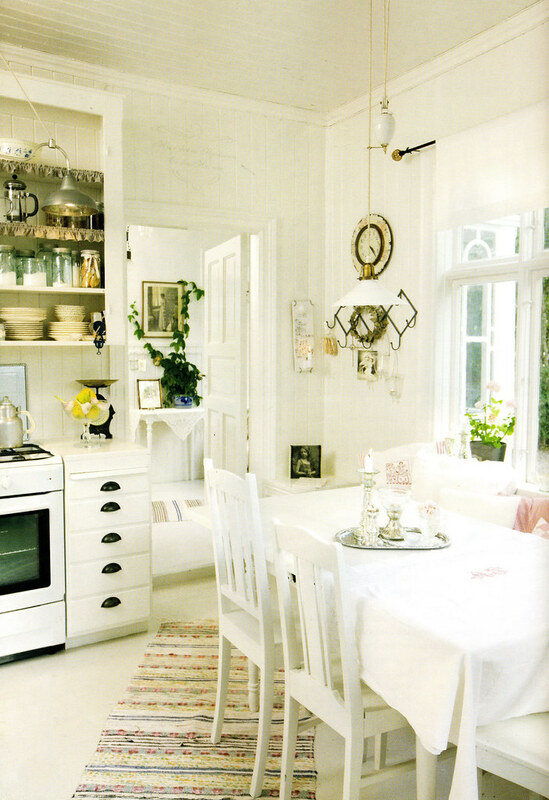 There's a Scandinavian aesthetic to this kitchen. Another: LOVE! Nate Berkus' kitchen in his Milan apartment is another Wow! See what I mean? He has a vision! This is European modern elegance. It's quite sophisticated, with strength in large color elements, yet quiet. The brown leather chair adds a feeling that this is a room, not only a utilitarian kitchen, and the color of the chair adds life. Very well done! The lighting fixture, honestly, to my eye, is the perfect touch. LOVE! Nate, I'd love to see more kitchens! This sampling alone includes such a great collection of creative and diverse (and unexpected) details, don't you think? First two images from Oprah.com, last image from ElleDecor.com. Buh Bye 2009 - Hello 2010! 2009 was my best year and my not-so-great year for various reasons. The best part of 2009 was the birth of my first grandchild, Chloe, a bundle of joy from my precious daughter, Kelly. Everyone can just stop having babies now, ok? Chloe has broken the mold for the most perfect baby ever. Done! The not-so-great year was because, well, who wants to talk about that when we're ringing out the old and ringing in the new? In FACT, I'd say looking at 2010, I can tell you that some VERY wonderful things are going to happen in my world, a couple of which will be big surprises when I share them with you - that's all I'll say! I have great excitement, hope, and positive expectations for 2010. I feel poised more than ever before to contribute positively to my industry, an industry I truly love working in every day, and to all of my readers who look to me for insight and information on all things kitchen design-related. My passion for the work that I do in its various forms, is stronger day by day. I feel I am now, and for the foreseeable future, at the best place possible in my career. 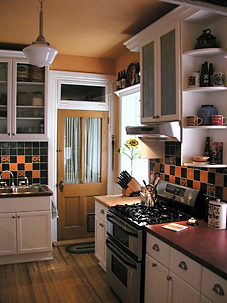 I have many years of well-rounded experience as a Certified Kitchen Designer and sole proprietor of my business. I'm, by definition-my family would attest (and groan)-a constant deep thinker, an observer of people, of where we are now, where we might be going and of the tools we choose to use along the way which define who we are and how we aspire to live. I look for the "profound" in the "simple." The meaning. My 3 large monitors at my desk assure productivity, although I do (productively) lollygag more than I should. And, of course, I design kitchens and do phone consultations in between all of this busyness, not to mention monitoring my Twitter account, 2-Facebook accounts, blogging and guest blogging duties. If my updates here are not as frequent as they should be, that's why. I would love to change that and post more frequently. I have ramped up my knowledge/product/design-seeking activities relating to kitchen design since I started blogging nearly 3 years ago, and this year, my pace has dramatically quickened in an enthusiastic effort to take it all in! I need to say this...SO often, I'll be somewhere, seeing something interesting and think, I have to share that, I have to write about that! Sometimes I do, and often, other duties intervene and I just do not get to it. The point is, this blog is a little piece of my soul, it really is, and that is because the kitchen is where life happens...the soulfulness of food, its loving preparation, made for one-enjoying solace and thought at the table, or for a boisterous family. The process, which ends in finding one's favorite seat, or gathering around a table, is what rejuvenates our bodies and spirits. I could write two paragraphs easily on meaningful activities that take place in the kitchen and the profound impact these activities have on an individual or a family, but I'll save that for another time. Suffice to say, the kitchen is a special place for me. I know it contributes good, nurturing, and nutricious things for our well being and I know you feel a similar way. Isn't it great to share our thoughts about this fantastic, seemingly utilitarian space in our homes? It's not so simple as being defined as a place to prepare food. Trust me. It's all good...really good. I had NO idea I'd be writing this lengthy piece. I just wanted to say Happy New Year and show you where I went last night! But, it's fitting to elaborate at the year's end, and I wanted to let you in just a bit on how I think, how I work, and how I love working in this segment of the design industry. Plus, as I said, I'm feeling VERY positive about 2010 and wished to share that with you too. So LOOK where I went yesterday! I went to the top of 1 Times Square where the fabulous (12 feet wide!) handcrafted, Waterford crystal ball is going to drop on Times Square, illuminated by Philips LED colored lights. Waterford Crystal hosted the event and the glasses in the slide show below are Waterford crystal. The representative from Waterford wants everyone to use their crystal every day...it's strong! Follow the 6 1/2 hour broadcast and interact with other revelers around the world via Twitter and Facebook. Me, I'll be checking into this party, absolutely, but first, I'll be strolling down (probably in the rain and/or sleet) from my apartment on the upper west side to Dizzy's, one of my very favorite places in New York, and back again to settle in after the set. When fireworks erupt loudly in Central Park at midnight, we'll go down to the street, look upward to see the show, and be thankful for a wonderful first moment of 2010!! HERE'S THE SLIDE SHOW OF THE BALL UP CLOSE AND PERSONAL!! From my family to yours...Happiest of New Years! Oh, and let me point out the redhead in the back who, when I asked each person permission to use this image, said, "sure, go nuts with it." Taco night...last Saturday night...baby Chloe is sleeping! I confess, I am addicted to CNBC. This is being written as the Dow fell nearly 700 points, most of which happened in the last hour of trading. I admit to feeling that I am living in a dual reality...the writer of a blog talking about the virtues of owning a fabulous kitchen filled with fabulous products and the other extreme of hearing that we may be in for a severe recession (one person's opinion) in 2009, probably affecting many people's lives. So, where do I go from here? I'm a positive thinker (believe it or not) combined with being a realist. What I'm feeling now, at this moment, is that regardless of where you, the reader are, whether you are planning that fabulous kitchen or wondering what small tips you can get from this blog in an effort to either keep your kitchen for a longer time, in good shape, or prepare it for a home sale, there are common threads in these two extremes. 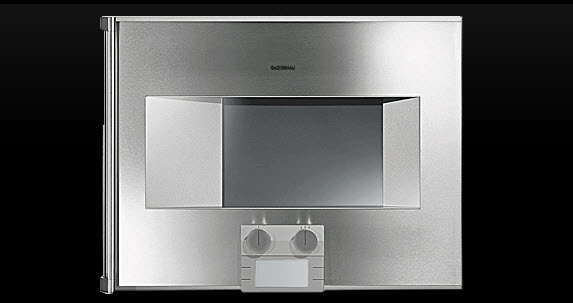 I think, which I hope has been an underlying theme in my blog, that one should look at one's kitchen or kitchen design, and get back to basics. Watch your stress level. Can you defer decisions? Do so, if you need to. I'm not sure, actually, if I'm making a whole lot of sense in this post, but, the metaphors of the "slow kitchen design" approach and "back to basics" perhaps will provide a bit of insight and opportunity for some to keep things on an even keel. 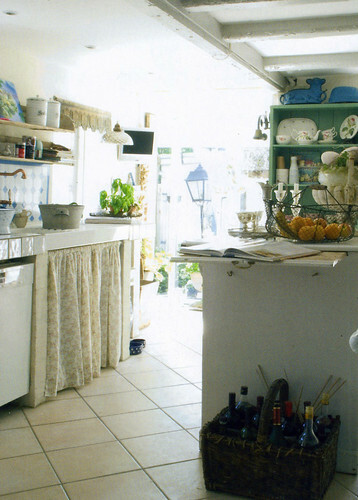 Let's talk about romantic kitchens, ok? Picture yourself in a cottage, set way back from the winding road. The house sits on a hill. The cottage garden is seen from the kitchen window and the vegetable garden is just beyond that. The kitchen, first and foremost, is a soothing place where its owner finds solace at any given time of day. People speak in soft voices, smiles and every motion in the kitchen is done with love. OK, I got a little carried away. Next thing you know I'd be saying there are no mortgage issues, no conflict...and nothing to clean up! We can dream, right? 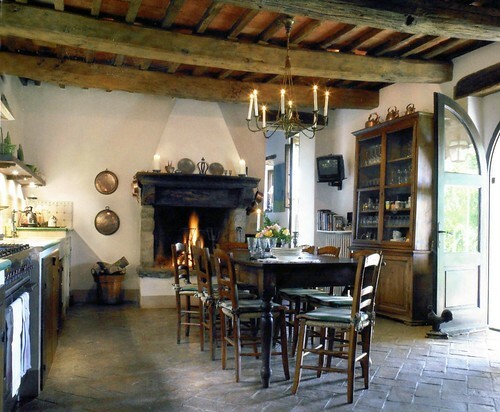 Looking at these kitchens, life appears bucolic, and maybe, just maybe, having a kitchen like one of these, contributes to "peace and contentment" being a bit more achievable in one's personal haven. 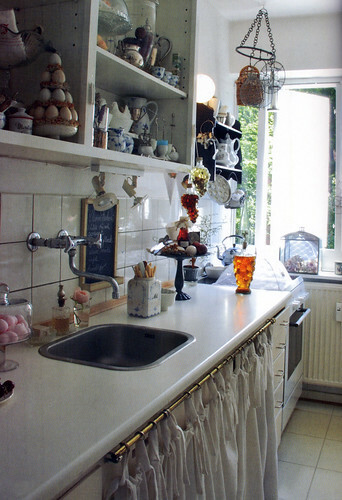 One can hope, and in any case, daydreaming seems quite easy in any of these kitchens..
What do you think are the attributes of a romantic kitchen? Do you like this style? All images from Vakre except the last one, from Cote Sud and the second to last from lantlivsdrommar.blogspot.com. Ok, I'm feeling the weekend coming on! We were "this close" to going to New Orleans this weekend for the JazzFest. We've gone 6 times since 1995. We MAY even go for a quick one nighter next weekend. Instead, this weekend, our daughter her husband, and their dog (who's afraid of our cat who gets into the tiger stalking stance at the sight of his rustling tail) are coming out for the weekend. I have declared this weekend, JazzFest weekend on the blog, and we will definitely have the music cranked up ALL WEEKEND, while we are all cooking together, with wine flowing, and as I have it on right now on my computer, as there will be LIVE programming from the Fest! Here's where you go to take part in your own version of dancing in the kitchen while you're cooking this weekend! Go to WWOZ! To me, that's when a kitchen really lives up to its full potential...loved ones, music, wine, good food, pets, what else is there?? Enjoy! Bar none, even Thanksgiving day itself, I'd say Thanksgiving eve is my most favorite day of the year. It's all potential at this point! The kids come home, we all begin to cook, chaos abounds, wine flows, the cat attacks the visiting dog, we get in each other's way, make the list for take-out, make a grand mess, and it's all good. It all happens in the kitchen at a fever pitch. 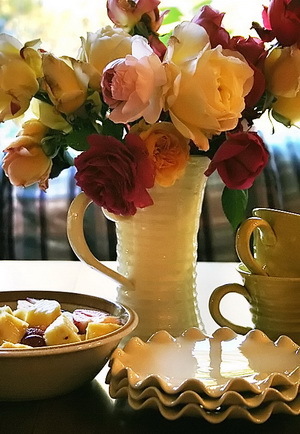 Nowhere else in the house does the combination of working together and relating, occur, except the kitchen, together with the sensory pieces of food, colors, music, and so much love floating around, too, of course. My daughter and I, since yesterday, and probably before then, have been exchanging emails with multiple exclamation marks. Me saying "Come Home!!" multiple times, and she (having an otherwise very responsible job in the city), with equal doses of enthusiastic responses. It WILL be an invasion in just a few hours from this moment. It's 12:44 as I write this. I guess I should start planning the menu. I picked up the turkey but that's all I've done. I use Thanksgiving as a metaphor for life's issues. When I haven't done a thing, by late afternoon, and I have 20 people coming for dinner, sometimes more, but much less this year (I do Thanksgiving every year, and I do completely it from scratch) I say to myself..."I'm not sure how I'll get this done, but somehow there will be food on the table tomorrow." I just don't sweat it....um, to a fault, I'd say. At this moment, I'm the only one home, and the quiet is interesting, knowing what's to come. 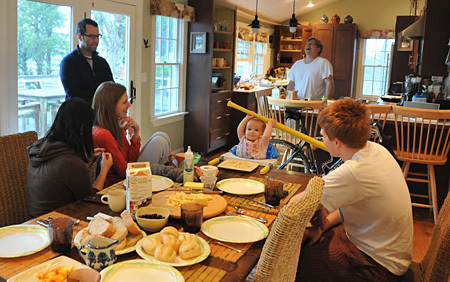 So, yes, the kitchen really is the heart of the home, and not just on Thanksgiving. My kitchen seems to work quite well for me. Maybe a few tweaks could make it function a little better. I could be more organized with storage...where "categories" of items are stored for logical access. Maybe I'll work on that next. Other than that, it serves me well. 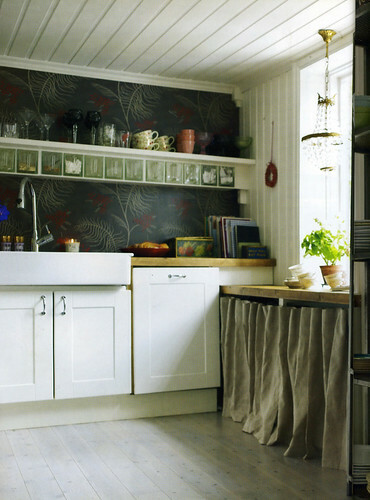 Are you planning a kitchen renovation? Do yourself a favor and try to be aware of how you work in the kitchen. What is a habit, and what is a preference? How is your access to food and cookware items? What is stored too tightly together? What items are in the "other room" because there is not room in the kitchen? Who is working where, and do you need more work "stations?" How is the lighting? Try to notice what is working and what is not working in a curious way instead of a frustrated way. Make notes. But, in between, enjoy every moment. I hope your Thanksgiving is wonderful. Please tell me about what you're doing, and how your kitchen works for you for Thanksgiving! I'd love for you to share your thoughts. Today, I present kitchens to put a smile on your face. First up is the fabulous Fabulon. I swear, Fabulon is obsessed with kitchens. I've had other great material from this blogging kitchen fan. Oh, and please turn up your speakers when you visit. Jo and Kim from Desire to Inspire never ever disappoint, with frequent forays into the kitchenworld. Did you ask for more from Desire to Inspire? Ok, you have it, then go here to a beautiful kitchen and here to another beautiful kitchen. And, also, check out Terramia, for inspiring PINK kitchens...you'll need to exercise your scrolling pointer finger to seek out two kitchens in this post, but it's worth it! 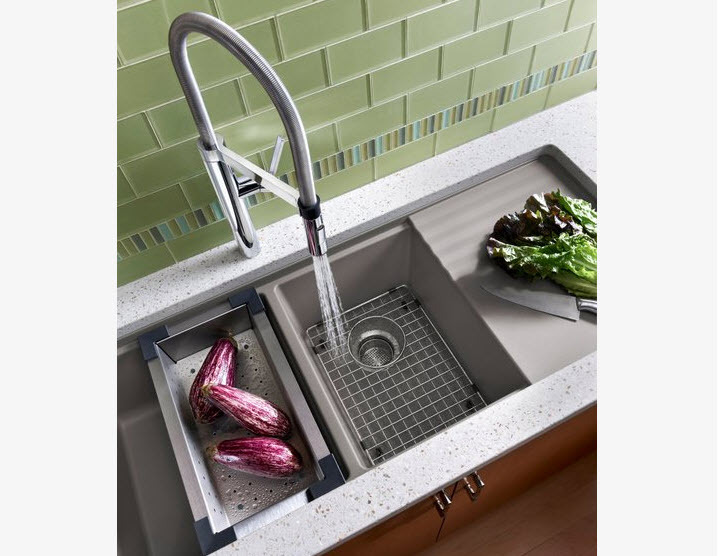 And, a nice idea for a sink/countertop from my colleague Peggy, at Kitchen-exchange. 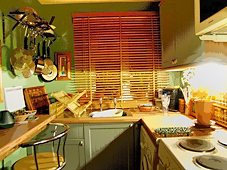 Normal Room - The Best Kitchens! 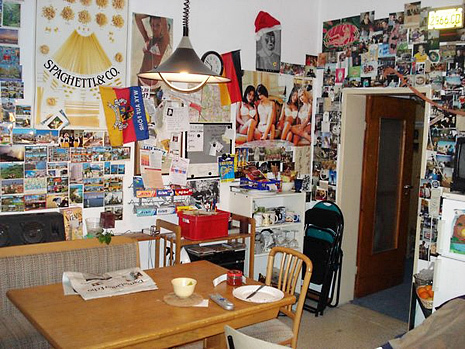 Many of you have heard of Normal Room, the website where people from all over the world upload images of the rooms in their home, just to show others how they live and to see how others live. A great concept to make the world a little bit smaller and to understand a little bit better how other cultures do what we do, cook.....and, think about what's the same, what's different....it's all good, right? So, as a dutiful editor of a kitchen design blog, I went through the entire category of kitchens and chose the ones I thought were most interesting to me. 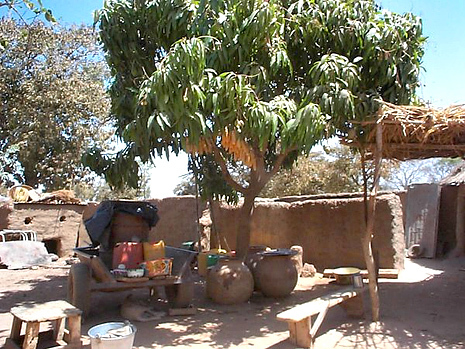 The first image IS a kitchen, a typical kitchen somewhere in Africa...the 2 just below, I did not take note of, the 3rd image on the left is from the U.S., the 4th image on the right is from the UK, and the bottom image is, of course, from Finland. Oops, the one with the postcards before Finland is Germany. 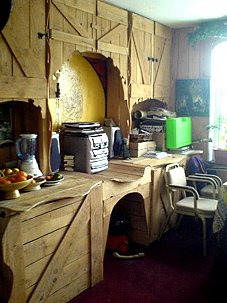 And, check out my friend, Peggy's post too on an unusual kitchen. Enjoy! 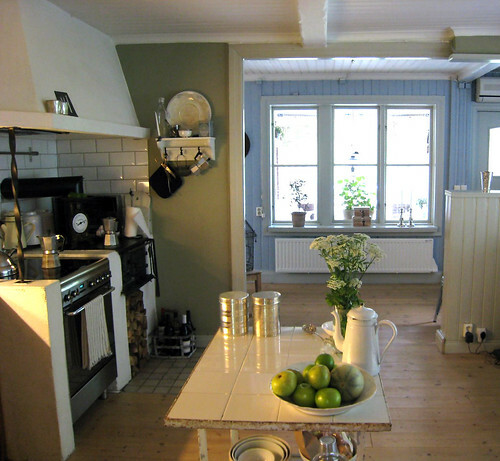 Kitchens are popping up like spring flowers around the blogosphere. 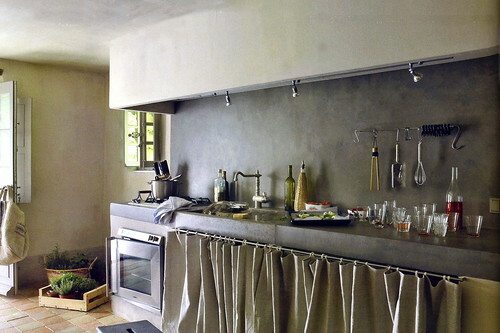 All sorts of good stuff I am finding on kitchen design, kitchen products, kitchen remodeling too. 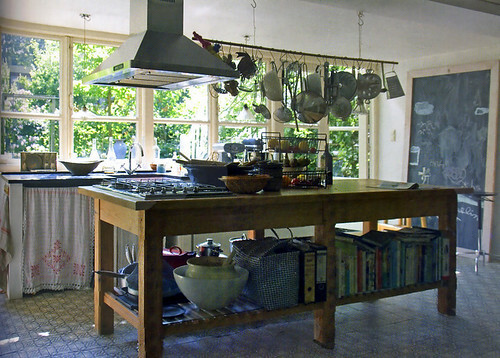 I was almost blown away when I saw images of Julia Child's kitchen on The Happy Living Blog. I suppose the kitchen is pure function! I remember hearing about the pegboard somewhere being in Julia's kitchen. Here is a link to the exhibit at the Smithsonian of Julia's kitchen. Thanks for this reminder of this interesting kitchen! 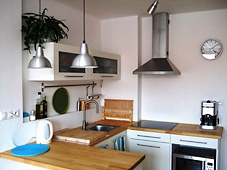 And, what is this about a kitchen consultation you were at, as seen on your blog? Keep me in the loop! A great segue to The Kitchen at Apartment Therapy, filled with not only recipes, but lots of stuff for the kitchen, including tips on products, cooking methods, and more. What really blew me away this morning were the images on Desire to Inspire. The kitchens! They're filled with soul, and earthy textures. 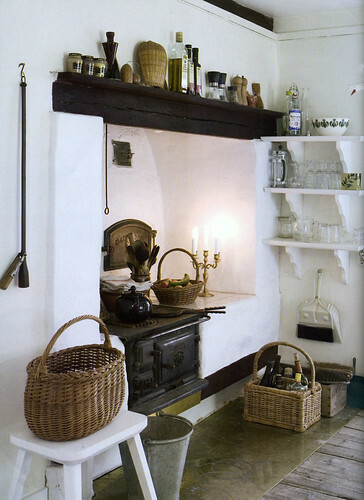 Eclectic, with pieces of this and that, thrown together, yet, warm and welcoming, which is what a kitchen should be, right? 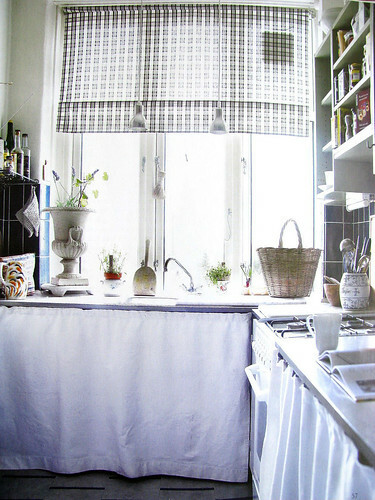 The image is from Desire to Inspire, by Elle Decor. All around good stuff too in Appliance Notes. This blog is authored by my friend, Peggy, and I think she'll be coming up with all kinds of interesting pieces of good information in this new blog of hers. Take a look. Our daughter and son in law are out for the weekend, along with their dog, Max. We're trying to introduce our new cat to their dog, and we can't figure out who's scared of who. The cat hissed once, the dog barked and barked (but his tail wagged, so did he want to play?) This was the weekend's excitement. Luckily, the dog is a small 25 lbs so they're on fairly equal territory. Random kitchen images follow (not of this weekend). I think the best times of the weekend are definitely centered around meals and cooking. Cooking dinner, we break out the wine, always. Someone is at the (indoor) grill, someone is chopping something, and someone else is hanging out at the table chatting, casually on a laptop, whatever. The music is on. After a super busy week of demanding jobs and obligations of various sorts, I'm convinced that there are pieces to our kitchen design that help dissolve those working stresses real fast. See family and friends VERY relaxed! I'd LOVE to know what makes your kitchen people friendly, conducive to relating. Please do tell!